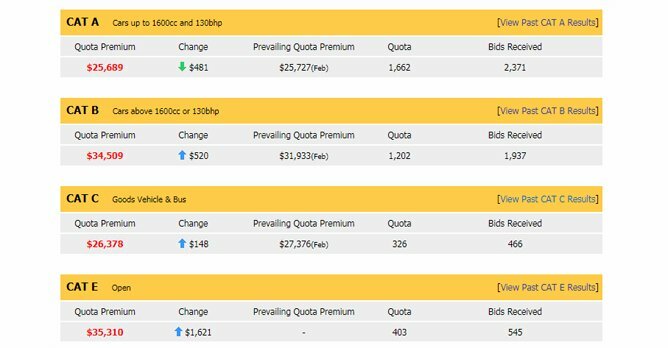 In the first round of bidding in February, Cat B and E premiums increased, while premiums for Cat A dipped. Premiums for Cat A, for cars up to 1,600cc in engine capacity and with an output of no more than 130bhp, fell by $481 (1.83%) and ended at $25,689. Premiums for Cat B, larger cars with more than 130bhp or engine displacements larger than 1,600cc, increased by $520 (1.52%) and ended at $34,509. In Cat E, the open category, premiums went up by $1,621 (4.81%), with premiums closing at $35,310. As the Land Transport Authority had announced earlier that the supply of COEs for all categories will be reduced in the next three months, the increase in COE prices in general comes as no surprise. Cat E will see the biggest reduction in the supply of COEs at 26.4%, which likely attributed to it recording the biggest increase in this round of bidding.